At Beacon Capital, our investment thesis focuses on early stage enterprise tech ventures. We have created a (first draft) representation of the landscape as we see it, and hope that this will serve as an interesting starting point for discussion. In our experience, many startups in enterprise tech find it difficult to reach the key players in the space and it can be difficult to know the relative strengths of the players and how they fit in. We hope that, in the long term, this resource becomes a comprehensive view of the enterprise tech ecosystem. There are of course many ways of representing the enterprise landscape. The players don’t perfectly fit into compartments, some have multiple roles, and they can change direction or focus over time. We tried to fit players into our classification of enablers and investors to reflect the practicalities of starting an enterprise tech venture. Vertical specific accelerators are building up knowledge in a defined area, theme or sector. They serve as a good platform for idea validation, sometimes with the help of industry specific partners. As an example, CyLon has emerged as the go to place for entrepreneurs determined to solve cybersecurity challenges. Corporate accelerators, as the name suggests, are commissioned by the institutional players in particular sector and give early access to product trials and POCs for product validation. Barclays is one such corporate to have followed the model in the financial technology space. Industry institutions such as universities, research institutions, etc support the UK as a STEM player and provide greatest value to teams through the tech expertise and quality of industry mentorship. Service providers are at integral place in our ecosystem closing the bridge in terms of technological, marketing and PR challenges that most businesses face during their lifetime. Public and government associations are of strategic importance working as door openers for the UK ecosystem by giving access to and dialogue with foreign markets and to global organisations. Early stage enterprise dominant investors play in the black hole typically spanning seed and pre-series A. This is a disorganised space, made even more chaotic as B2C angel investors increasingly turn to B2B. In reality there are very few investors with enterprise tech expertise who have practised the dark art of closing a pre-A funding round. Later stage enterprise dominant investors contain both equity as well as debt investors but only for those startups with greater than £500k ARR. By this point the investee companies would typically have proven their product fit with the buyers and the capital is primarily to scale up the sales & marketing engines. Generalist investors dip their toes but do not have deep understanding of the sector. They are happy to participate in deals to build up their knowledge on the sector but have no immediate plans to invest heavily in enterprise tech ventures as part of their current focus. We had to leave out several players to make the landscape intelligible, and there will definitely be some discrepancies here. 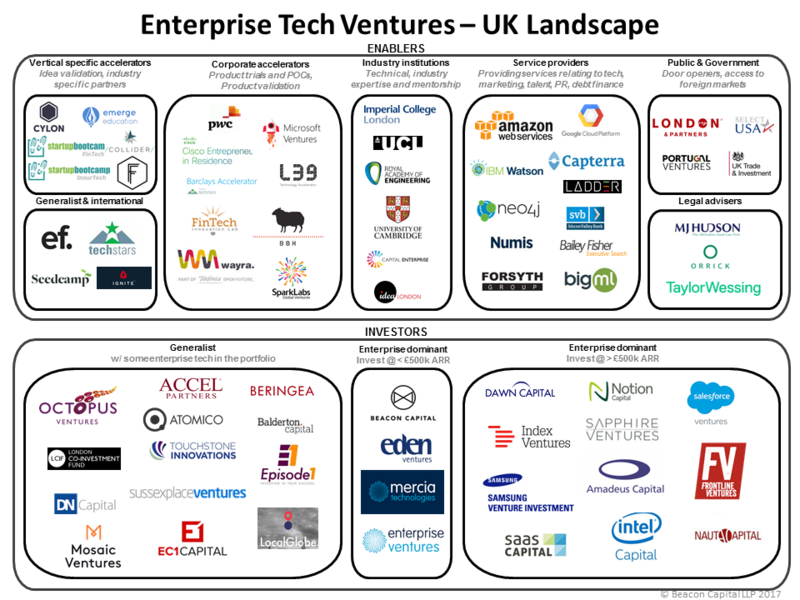 This is a draft, and we hope it will help uncover more detail on, and draw attention to the UK enterprise software players. Let us know if you have any thoughts or further suggestions to this landscape. Feel free to reach me by email on sanchit.dhote@beaconcapital.co.uk and I can then share with you a link to the google doc where we can together try and keep up to date the key players in the enterprise tech ecosystem.